Technology more and more influences how we live our daily lives. 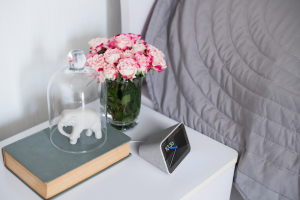 Whether it’s new technology in our vehicle that prevents us from getting into an accident, our mobile phone that connects us to our friends and family, or the latest voice-controlled home assistant, you can count on CES showing the very latest in game-changing tech. Of course, we were there again this year and we joined over 5,000 exhibiting companies there. CES is big: with more than 2.7 million net square feet of exhibit space and about 180,000 visitors walking the show floor, it can be hard to get from one place to the next. We hosted our customers and industry friends in our suite at the Westgate, located right at the convention center. Having our suite at the Westgate gave us a nice and quiet space to have over 40 productive customer and partner meetings. Videantis is growing, as our demos showed. On display we had multiple smart automotive cameras from Tier 1s that include videantis processors to perform computer vision, imaging, and video coding functions. Your next vehicle is very likely to have a videantis processor on board somewhere, staying cool while performing a wide variety of visual computing tasks, making your ride safer. We also demonstrated our deep learning v-MP6000UDX processor and v-CNNDesigner mapping tool, Structure from Motion/SLAM, low delay video compression for automotive Ethernet, feature detection and optical flow, and OpenCV acceleration, all running in silicon on our own multicore, high-performance, low-power processor architecture. 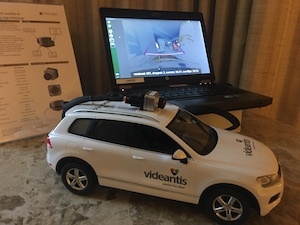 You can watch the video that the Embedded Vision Alliance shot of our own Tony Picard giving an overview of videantis and walking through our demonstrations. For those that weren’t there, here’s an overview of the trends we spotted at CES. And even if you were there, you may have felt just like we do every year, that CES just feels like “more of the same” even though there’s clear progress made every year. This list of trends is also for you. IBM Chairman Ginni Rometty’s opening keynote explored how AI will prove data is the “world’s greatest natural resource,” enabling revolutions from smart cities to health care, transportation to robotics. As examples, Rometty showed a fingernail sensor that collects data to give an early diagnosis of Alzheimer’s and Parkinson’s. Another example was crowdsourcing data from devices, like barometric data from smartphones and inflight data from aircraft. This data can then be used to make weather predictions more accurate. Another example were Intel and Alibaba that announced they’re jointly working on a system that performs real-time tracking of athletes. 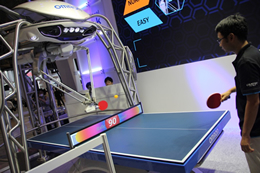 Omron showed its ping-pong playing robot Forpheus, which uses AI to judge its opponent’s skill level and adjusts its own playing level to match it. Perhaps funniest was a Qualcomm executive giving a presentation of Alexa being integrated into its automotive products. As the exec highlighted the system’s features such as supporting high resolution displays and distributed content, Alexa showed it had a mind of its own and commented out loud that “no that’s not true”, causing the audience to burst out in laughter. But even though AI sometimes go wrong, everyone is clearly on the same page: AI will play a key role in almost every electronics device, and thus in our lives in the near future. Smart home devices were another key trend. Oral-B showcased an electric toothbrush that tracks how you’re brushing, then uses AI to give personalized feedback on how well you’re doing. Samsung showed new refrigerators, ovens, and washers that all connected over the Internet to the company’s Bixby assistant. LG unveiled HomeBrew, a craft beer system which automates brewing a fresh beer right in your home. LG also announced a smart freestanding wardrobe with a built-in steamer that cleans your clothes. But voice assistants were really the star of the show. Amazon announced they have more than 100 Alexa-supporting products on the market now, while Google wrote that its assistant works with over 1,600 home automation brands and more than 10,000 devices. While a lot of voice-centric devices have been launched, more camera driven products are being planned. Displays aren’t just rectangles anymore. Many phones on the market today have rounded corners and notches, or even small holes for the selfie camera. 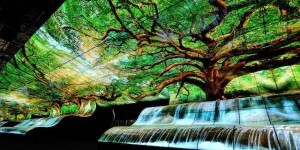 The next logical step is perhaps to make the displays foldable also. And while no mass-market products were announced at CES, LG stole the show with its rollable TV and the perhaps even more impressive huge curved display that stood a full 65 feet in width, and 20 feet high, using a whopping 260 screens. Besides LG, Samsung and Huawei showed foldable displays also. Only the future will tell if this trend will really catch on, but the demos are enticing for sure. On the way home from CES, I started counting the number of displays at the airport but quickly lost track – there were hundreds. Whether it’s displays in our hands, on our desks, or on the street, all of them are connected and are showing video and images. Many will incorporate smart image-processing functions to present the perfect picture, and cameras to understand who’s looking at them. While 5G-enabled phones aren’t available yet, the first 5G networks already went up late last year. 5G’s promise is to bring high-bandwidth data connections, up to 1Gbps, with ultra-low latency, to a wide variety of devices. Qualcomm’s booth had a big 5G section showing what it’s capable of with smartphones and VR headsets. One demonstration showed a video streaming into a VR headset, playing entirely over a 5G network without noticeable latency. It’s still early days though – Samsung showed its 5G prototype smartphone under a sheet of protective glass for instance. Just like AI, 5G is an enabling technology with a wide variety of potential applications. Providing high-bandwidth, low-latency data connections over a large distance is sure to transform and enable many new consumer electronic devices. 5G was a major theme at CES, but since the rollout requires a major new infrastructure, it’ll take a while before its impact will be clear. Of course, we can’t get away without mentioning automotive. Electronics are becoming a bigger part of vehicles and vehicles are becoming a bigger part of this electronics show. 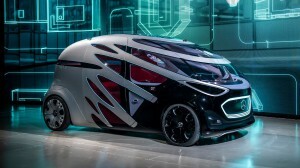 The automotive industry has clearly become one of the key pillars of CES. There were many concept cars, visions of what the cockpit of the future will look like, and of course many self-driving vehicles. But another key trend was visible too: instead of focusing on the future, many companies have started focusing less on the future, and more on tomorrow, i.e. what technology can we really bring into volume production in the next-generation car models. Mobileye and NVIDIA for instance had much more of a focus on driver assistance this year than on full autonomy, a trend that videantis already picked up on several years ago. Our technology has been optimized for maximum performance at power and cost levels that enable adoption by mass-market vehicles. Another thing we’ve seen is that EuroNCAP has been doing a really good job in driving the requirements for bringing new safety-enhancing technology into the mass-market vehicles also. Reaching a 5-star EuroNCAP rating requires adoption of more and more driver assistance features now. EuroNCAP will also become more involved in testing these new safety features. Another trend from CES was the focus on adding more cameras to the vehicle’s interior now also. While future cars will have more than a dozen cameras on the outside, another dozen cameras will be added to the inside of the vehicle also. These interior cameras focus on three main areas: monitoring the driver, for example to ensure the driver is still paying attention to the road, monitoring the other occupants of the vehicle, e.g. for airbag deployment or to ensure small children are not left behind, and on gesture recognition, to operate the infotainment system in the dashboard. Lidar remains a hot field, with more than 70 global startups that are all working on their unique technology. What type of system will win there will remain unclear for some time to come. Of course, there’s an ongoing trend to introduce more and better smart rear, surround, front, and electronic mirror cameras. Quite a few companies were showing their vehicle simulation systems that can be used to validate these new smart sensing systems. Driving millions of miles on the road is hard and takes a lot of time – running these systems in simulators is much faster and allows for an easy reproduction of a wide variety of complex situations. Visual computing and smart sensing played an even bigger role at CES again this year. Vehicles include more and more imaging technologies. Whether it’s radar, lidar or cameras, all this data needs to be processed and analyzed to extract higher-level information that can be used to operate the vehicle or assist the driver. Whether it’s our vehicle, devices that make our homes smarter, or new displays that are better looking and connected, all these applications rely on semiconductors that can efficiently process image data. Whether these images are being captured with a camera or being transmitted to a display, having an efficient visual processing system plays a crucial role. With our unique deep learning, computer vision and video coding processor IP and optimized software, videantis is at the heart of the rapid adoption of these new technologies into our lives. Like always, CES was a blast. Thanks for being there with us and we’re looking forward to meeting you again next year!